It’s the four year anniversary of the Green Bus, and we thought it would be a great opportunity to bring everyone up to date on all the amazing things we’ve been up to, and invite you to co-create the vision we see for 2014 & beyond! and turn more of our visions into reality! What is the Green Bus? 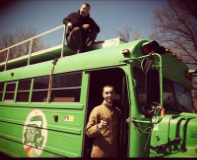 The Green Bus is an inter-dimensional spaceship that brings you here and now, and helps you find yourself. We rescue people from the city and bring them on transformational journeys to cosmic places. 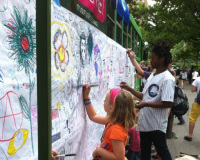 The Green Bus is also a mobile demonstration of sustainable solutions and innovative thinking. It has been converted to run on waste vegetable oil that we get from partnering restaurants and is constantly being upgraded and transformed. This year we plan to integrate a rooftop garden and rain catchment system into our roofdeck stage, upgrade the onboard kitchen, and acquire solar panels to install the roof. 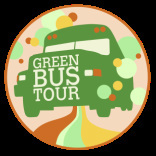 What is Green Bus Tour? 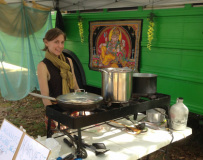 Green Bus Tour is a community project out to inspire a culture of conscious living through creative collaboration and by promoting a healthy, sustainable lifestyle. We are an ever-expanding community of artists, musicians, healers, visionary thinkers and sacred activists that co-create participatory transformational events, featuring interactive art and live performances.